The apple doesn’t fall far from the tree. Axioms aside, neither do acorns. How, then, do oak saplings grow anywhere but directly beneath or downhill of adult oaks? How can they possibly end up on ridges, where gravity couldn’t possibly take them? Acorns can be dispersed by gravity and flowing water, but for the most part they are spread by animals. 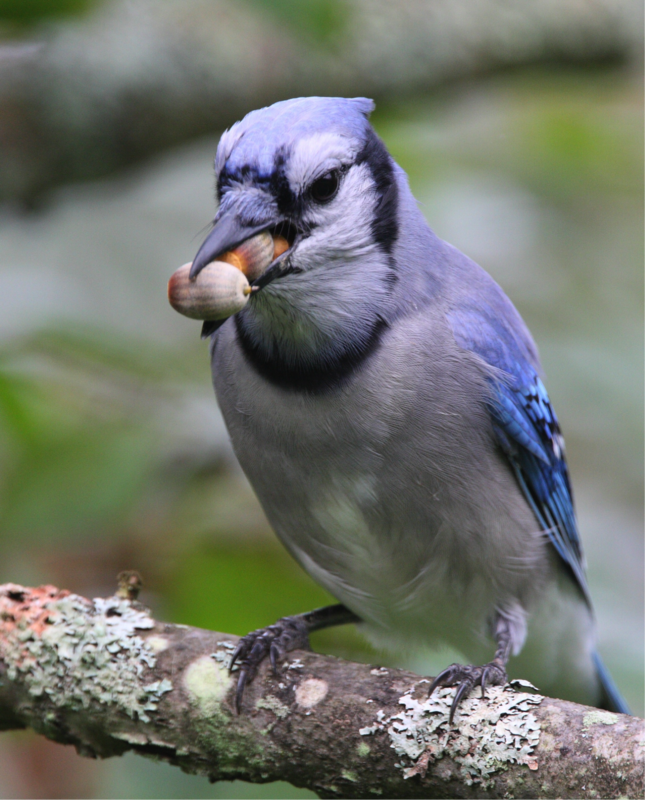 Squirrels and blue jays inadvertently plant oaks every year; they gather nuts and cache them for later, and the acorns they forget to dig up and eat will germinate and become established. Oaks can’t rely on the forgetfulness of their predators, however. Over millennia they have evolved complex mechanisms to find balance between discouraging the consumption of all acorns and enjoying dispersal by animals. Before examining oak interactions with wildlife, it is important to note that subsets of oaks have distinct characteristics and behave differently from each other. There are two groups of oaks: white oaks such as chestnut oak (Quercus montana), post oak (Q. stellata), and of course white oak (Q. alba); and red oaks such as northern red oak (Q. rubra), scarlet oak (Q. coccinea), and pin oak (Q. palustris). The groups differ in acorn chemistry and in reproductive timing, which both have implications for their ecology. Acorns contain tannins, which are bitter and toxic chemicals found in many plant materials. The compounds are present in lower levels within white oak acorns than within red oak acorns, making white oak acorns more palatable to animals. White oak acorns mature over one summer, drop in autumn, and quickly germinate. Red oak acorns mature partially over one summer, go dormant over the winter, and may or may not resume maturation the next spring. When red oak acorns do mature (two years after fertilization), they drop in autumn and don’t begin germinating until the next spring. Although the acorn maturation cycle takes two years, a red oak flowers each year, so there are typically acorns of different ages on an individual tree. The period for pollination is only around 10 days for all oaks, so environmental conditions can make or break the resulting acorn crop. Acorn production notably goes through dramatic boom-and-bust cycles, where some years the “mast” (acorn crop and other nuts, such as hickory) is extremely high and in others it is absent. 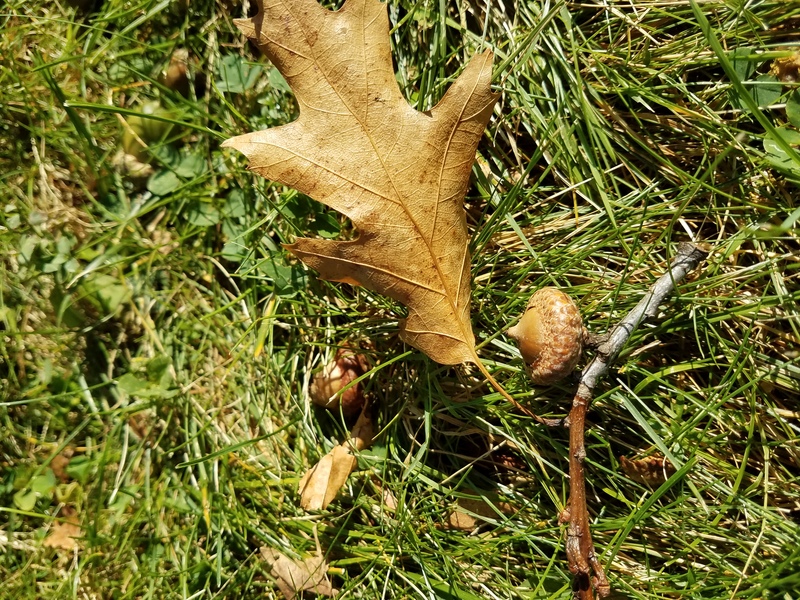 In years where conditions align against oak fertilization, white oaks will produce very few acorns while red oaks may still drop vast quantities. The tannins mentioned above are an acorn’s first line of defense against predators. Lower tannin levels in white oaks mean that acorns of this group are preferentially eaten by wildlife, while red oak acorns are passed over until later in the winter, when food is scarce. This is why white oaks germinate quickly after falling; the growing taproot converts stored nutrients into plant material that is less palatable to predators and also corkscrews the acorn into the soil, making it harder for wildlife to come across. Red oak acorns rely on their high tannin levels to discourage predation, so they do not have to germinate until spring. In years where food is less plentiful, even the very bitter red oak acorns that are still lying on the forest floor will be eaten. This is where the caching behavior of some animals mentioned above comes in. Squirrels and blue jays immediately eat the more palatable white oak acorns that they come across, and bury red oak acorns for later. 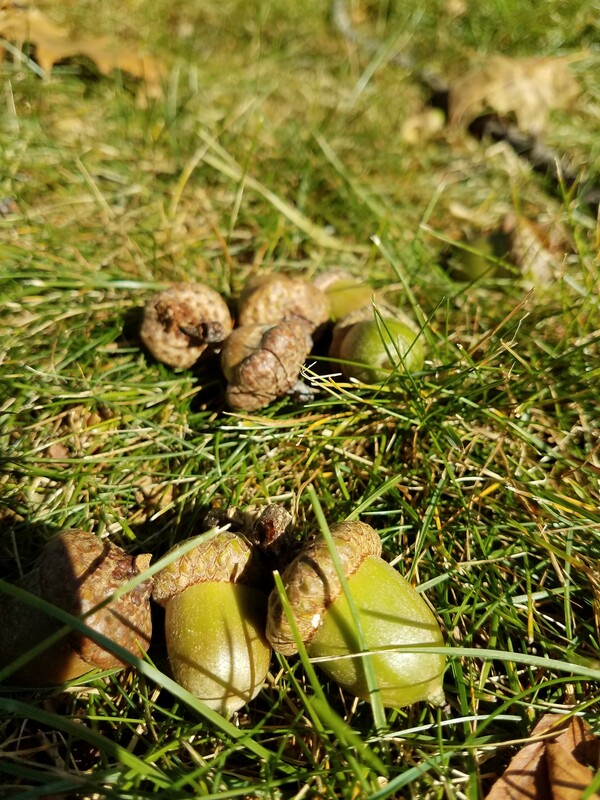 Under ground, the red oak acorns are safe from deer, turkey, ruffed grouse, and other wildlife, and if their hoarder forgets where they were buried or dies over the winter, the acorns are perfectly situated to develop into a seedling in the spring. The red oak gambles that its lack of fall germination means it will be buried, and that it will last there until the spring to sprout. The white oak gambles that it will germinate quickly enough to be unpalatable by squirrels and less visible to other predators. Dramatic mast cycles are another way that oaks ensure the survival of some of their progeny. Acorns are critical dietary components of many wildlife residents of eastern deciduous forests, to the extent that their absence can restrict population sizes. Years of low to moderate acorn crops maintain population capacities of acorn-consuming animals, so that in years of heavy production there are too many acorns to be eaten. Mast cycling combined with tannin levels and germination strategies are enough to guarantee that in the long run not all acorns are eaten, and for red oaks, that many are planted by their very predators. Every strategy is advantageous for a certain subset of environmental and ecological conditions, where long-lived oak trees can yield new generations of these keystone species in our Chesapeake Forests. Learn more about oaks and forest ecology at forestsforthebay.org, or contact Ryan at rdavis@allianceforthebay.org.